Your mini astronaut will carry everything they need for a successful daily orbit. Mornings on earth can be mundane. By the time your little one finishes breakfast and suits up, it's a mad dash for the shuttle (car) for the next mission (school day). 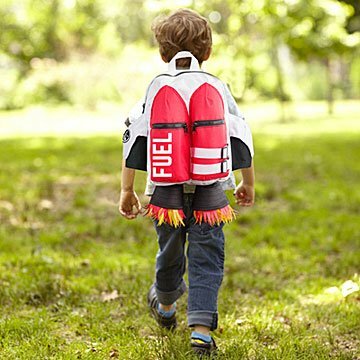 Take them from zero gravity to fire-fueled with their very own jetpack-inspired backpack. Featuring two nozzles with strips of fabric fire that flap and flicker in the wind, a spacious interior, and rear rocket pockets, mini astronauts will carry everything they need for a successful daily orbit. Made in China. Love it! A fantastic purchase! Is already stocked with adventuring supplies and ready to ...5, 4, 3, 2, 1....PLAY!! Very happy I bought this. A great unique gift. If this was felt, or had velcro, the planets from the Cape could attach to the backpack..and that would be stellar. This was an adorable backpack for my nephew who is almost three. It's smaller than expected so it doesn't fit a coloring book but it actually worked out that it's smaller because he's still young. Good quality and I'm excited for him to take it to school. This backpack makes my grandson look like the fastest kid in preschool!